Latest IDBI Bank notification is released for the IDBI 500 AM Vacancy. IDBI Assistant Manager Recruitment 2019 expecting the Graduation completed contenders to submit the application form. In the www.idbi.com Careers portal, IDBI Bank Asst Manager Online Form will release shortly. IDBI Assistant Manager Application Form is available is not known till now but the closing dates of the application are scheduled on 15th April 2019. The online exam of the IDBI Assistant Manager Recruitment 2019 is confirmed on the date of 17th May 2019. So contenders did the registration process as fast as possible to prepare for the exam. IDBI Bank AM 2019 Recruitment is released on 28th March 2019. Detailed notification having the full-fledged information of all the specifications is given by the IDBI careers section. For the bank job aspirants, this IDBI employment news is good news. It gives the offer of one of the high cadre jobs i.e. Assistant Manager vacancy to the Freshers. Yes, any Graduate without any experience can join as Assistant Manager if they are selected through the IDBI Assistant Manager Recruitment 2019. All the graduate holders to place in one of the best banks should have to know all the requirements of the bank officials. Primarily mark the application last date 15th April 2019. 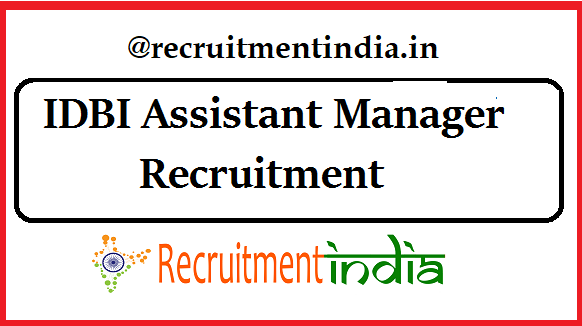 IDBI Assistant Manager Recruitment 2019 registration will begin at any moment. We will post the alert to the job seekers after the link activation of the officials. In the meantime for the activation of the application link contenders once go through the elaborated IDBI Bank AM Notification 2019. If you don’t have the time to audit the details present in the official notification, at least verify the data explained in this page. At any circumstance, the competitor should not move to the process of registration until he /she thoroughly knows the entire procedure of how to apply the recruitment, what are the documents to be uploaded in the IDBI Asst. Manager application form. Make you sure your application form should not be rejected by the IDBI Bank, then only you can participate in the selection process. Let’s start with the IDBI AM Educational Qualifications. One who is applying the IDBI AM Notification 2019 they must have the form a recognized university with minimum 60% marks(55% forSC/ST/PWD). Second important criteria are the age limit. Age relaxation of 3 years for OBC, 5 years for SC/ST, 10 years for PWD candidates are there. For each category applicants, the application fees have to be paid. IDBI implementing the below given selection rounds to fill up the 500 Assistant Manager(AM) Vacancy. IDBI Assistant Manager(AM) Salary is as per the salary norms of the organization. Along with the eligibility criteria, details like educational qualification, age limit another important section to be referred by the applicants is the IDBI AM Salary norms and application fees. Category wise application fees payment details are tabulated in the IDBI Assistant Manager Notification 2019. Before doing the final payment postulants must check the data entered by them is correct or not. Because after the successful payment application form cannot be edited. Once paid application fees is not going to be refunded. To understand the heights of competition in the exam contenders need to look after the IDBI Assistant Manager(AM) Vacancy in each category. For less number of vacancy, the competition would be in the highest range. So you have to prepare the syllabus in a perfect way. Focus on this page to pick the IDBI AM Online Form that will be opening shortly. IDBI bank careers section not given the application starting date but it has said the last date. After 15th April 2019, IDBI bank is not willing to accept the registration forms from the candidates. So we are instructing all the applicants to close the submission process of www.idbi.com Assistant Manager Application Form at the IDBI careers page on or before 15th April 2019. In the last minutes don’t rush to the application portal, the servers will be very busy. IDBI Assistant Manager Recruitment 2019 online registration closing on 15th April 2019 and the online examination is on 17th May 2019.